SOSE, HSIE, PDHPE, Humanities, English, Drama: Reading, viewing and interpreting imaginative texts; Literary and non-literary texts; Relationships with places; Problem solving; Taking action; Word play; Appreciation of language; Imaginative use of recycled objects; Creative thinking. A tale of how language evolves with plenty of LOL moments. lost in the same way you might lose your socks, your lunchbox, or even your homework. In the Wordsmith Laboratory Finn Furpy (Child Genius) and Dr Wild find lost words, invent new words, and solve word problems. They just have one more word problem to solve before they’ve finally solved more word problems than they’ve created. However, when Finn answers the phone to find there’s a fish on the line, their day is turned upside down trying to solve the biggest word problem yet. Teaching an octopus the alphabet, disguising yourself as a crab, and squabbling with a seagull are all in a day’s work when you’re trying to get words back into the ocean. 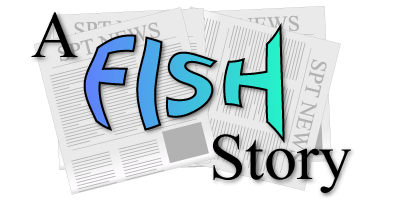 A Fish Story is an imaginative performance for children about problem solving, creative play, and of course, words. Michael has performed at Woodford Folk Festival, UNIMA International Congress & the Adelaide Fringe Festival. Beth has studied physical theatre & scenography in Paris and has a Masters in Puppetry. In 2010 & 2011 they ran a series of children’s workshops as part of the Victorian ‘Black Saturday’ bushfire recovery project and toured schools Australia wide with their show, The Bremen Town Musicians. All puppets are made from recycled materials. Very funny and entertaining. Excellent theme of environment care as well – very relevant to things happening in our school. I especially noted our kinder students who enjoyed the show immensely – some of them astounded their teacher as to just how much they absorbed from the show and just how much it made them think. Very entertaining and professional. Shiralee Morris. K-6. Nulkaba Public School. Cessnock. NSW. Aug 2018. Children enjoyed the performance, with lots of laughter. Julie McCarthy. K-2. Kilmore Primary School. Kilmore. VIC. Aug 2018. All students were engaged with the performance and enjoyed the story. Mike and Beth were very friendly and very professional. I would be more than happy to have them at EPS in the future. Nicole Comerford. K/Preps to Year 6. Elderslie Public School. Elderslie. NSW. 27/08/2018. Purple Capsicum Puppets ABN: 11 270 164 579.